Professor Emily Thornbury of Yale University is a scholar of Old English and Anglo-Latin literature, with a particular interest in early theories of aesthetics. 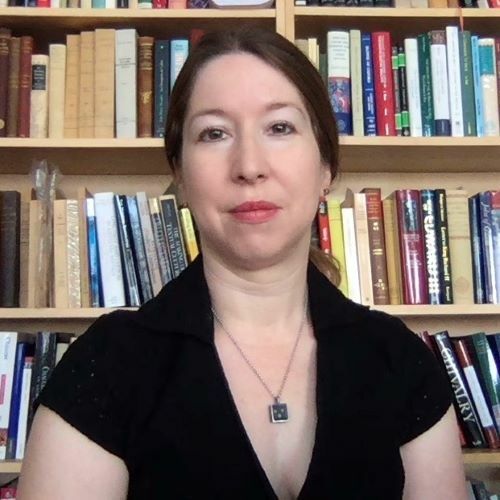 She joins the English department from the University of California at Berkeley. Her first book, Becoming a Poet in Anglo-Saxon England (Cambridge UP, 2014) explored how and why people set about composing verse in England prior to the Norman Conquest. Whether in English or Latin, the Anglo-Saxons’ poetry was enmeshed in the social circumstances in which it was composed, and reveals the ways that communities—or their absence—continually shaped and reshaped poets’ ideas of form and their expectations for what their art could achieve. Presently, Thornbury is working on a book called The Virtue of Ornament, which traces the nonclassical, largely untheorized aesthetic principles of Anglo-Saxon art and literature through a series of productive encounters with Classical forms. Ornament—understood in Classical aesthetics mainly as an extraneous overlay or elaboration, but by Anglo-Saxons as a transformative act—provides an entryway into a world of thought in which surface and depth, proportion, symmetry, and value itself had very different meanings. By understanding how ornament worked for the Anglo-Saxons, we can glimpse alternative ways of reading, seeing, and understanding art.